By Jim Dower: Gilberto ‘Zurdo’ Ramirez is challenging Saul Canelo Alvarez to come and try and take his WBO 168 pound title in 2019 after he gets done facing WBA ‘regular’ super middleweight Rocky Fielding (27-1, 15 KOs) on December 15 at Madison Square Garden in New York. 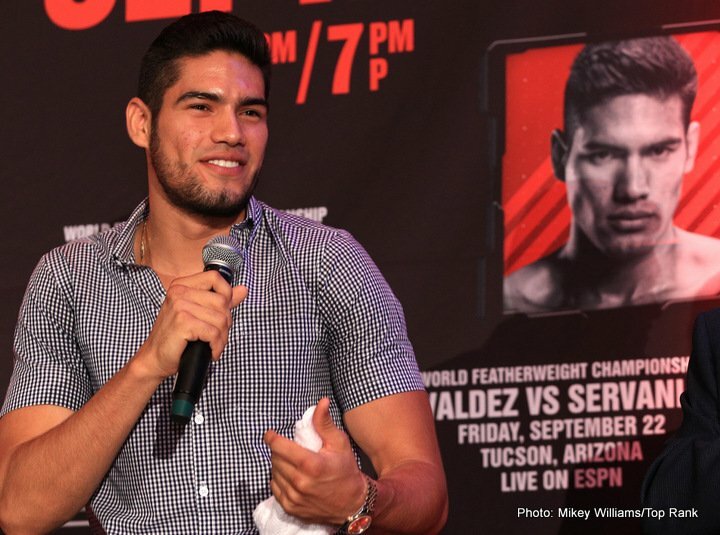 “Canelo here is my title, come and get it,” Zurdo said to You Can not Play Boxing. Canelo’s lack height would keep his promoters at Golden Boy Promotions from throwing him in with Ramirez. In one of Ramirez’s recent fights, he toyed with the 5’8″ Habit Ahmed, who was too short to land much of anything against him. Canelo is the same exact height as Ahmed. Golden Boy liked the idea of letting Canelo fight Fielding, but they’d probably veto the idea of him fighting Zurdo Ramirez, because he’s a talented fighter with good power, a great chin, and a high work rate. Ramirez would stand and fight Canelo the way that Gennady Golovkin said he would but didn’t. Ramirez, 6’2 1/2″, likes to fight on the inside rather than staying at range like most tall fighters do. Canelo would have a better chance trying to beat Ramirez than he would the other super middleweight champions, who know how to fight from the outside against shorter fighters. Canelo hasn’t said what his plans are beyond his fight with the 31-year-old Fielding, but he’s expected to move back down to 160 to begin defending his World Boxing Council middleweight title. The WBC voted to give Canelo a voluntary defense in his next fight. Canelo has the weight to stay at super middleweight to fight the likes of Ramirez, David Benavidez, Callum Smith and Jose Uzcategui. Ramirez is arguably a step above Fielding in terms of talent in the eyes of a lot of boxing fans. Callum Smith, David Benavidez and Jose Uzcategui are even in terms of boxing skills and punching power. Smith, 6’3″, might be the most dangerous for the 5’8″ Canelo because of his combination of power and height. Canelo has never fought anyone as tall and as powerful as Smith, and that would make it extremely tough on him if he were willing to take him on after he gets done with the fight with Fielding in December. Whether they count his title challenge against Fielding as having used up his voluntary defense is unknown. If the WBC aren’t counting the Fielding fight, then Canelo will get to make a voluntary defense in the first half of 2019 in May. Ramirez (38-0, 25 KOs) is a popular 168 lb champion from Mexico, who fights for promotional giant Top Rank. Ramirez won his WBO belt in beating Arthur Abraham by a 12 round unanimous decision in 2016. Ramirez has defended his World Boxing Organization title four times in beating Max Bursak, Jesse Hart, Habib Ahmed and Roamer Alexis Angulo. The only criticism you can make about Ramirez is with the way his promoters at Top Rank have been matching him since he became the WBO champion. Aside from his fight against Jesse Hart, Ramirez has been put in with no name fighters in Ahmed, Bursak and Angulo. Top Rank didn’t put Ramirez in the recent World Boxing Super Series super middleweight tournament, even though it would have given him a chance to increase his star power in boxing. If Ramirez had won the WBSS tourney, he would have become a bigger name than he is now. The fact that Ramirez was kept out of the WSSS tournament makes you wonder whether Top Rank has belief in him that he can beat the best fighters in the division. That was a missed opportunity on Ramirez and Top Rank’s part, because instead of him fighting the no name guys in Angulo and Ahmed during the past year, Ramirez could have fought the likes of George Groves, Callum Smith and Chris Eubank Jr. Ramirez not taking part in the WBSS tournament and failing to fight any notable super middleweights in the division makes it very hard to take him seriously when he calls out Canelo Alvarez. It’s unlikely that Canelo’s promoters at Golden Boy Promotions will work with Top Rank to match Alvarez against Ramirez. They’ve worked together in the past for certain fights, but it’s not probable that Golden Boy would want to risk their biggest money maker Canelo against a guy with size, skills and a certain degree of power in Ramirez at super middleweight.